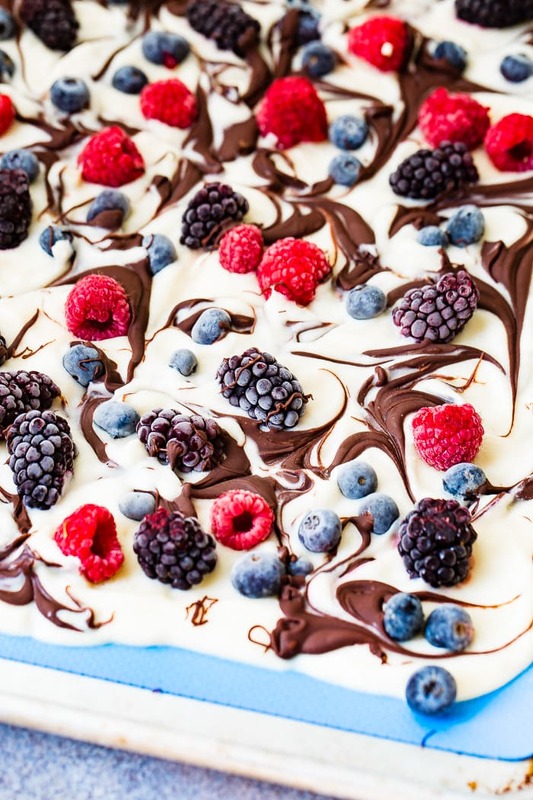 Our kids have been going crazy for this Healthy Chocolate Swirl Berry Yogurt Bark. 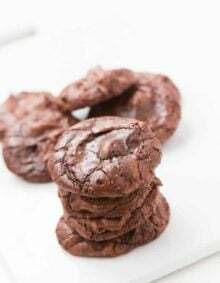 It takes 5 minutes to make and it’s a great after school snack! Every year, in fact every day it’s the same thing, trying to think up healthy snack ideas. I’m so over it. I mean, how many times can you really eat an apple, string cheese, almonds, etc? I get so tired of eating the same things all the time. I’m so excited to be sharing a new healthy snack idea with all of you! 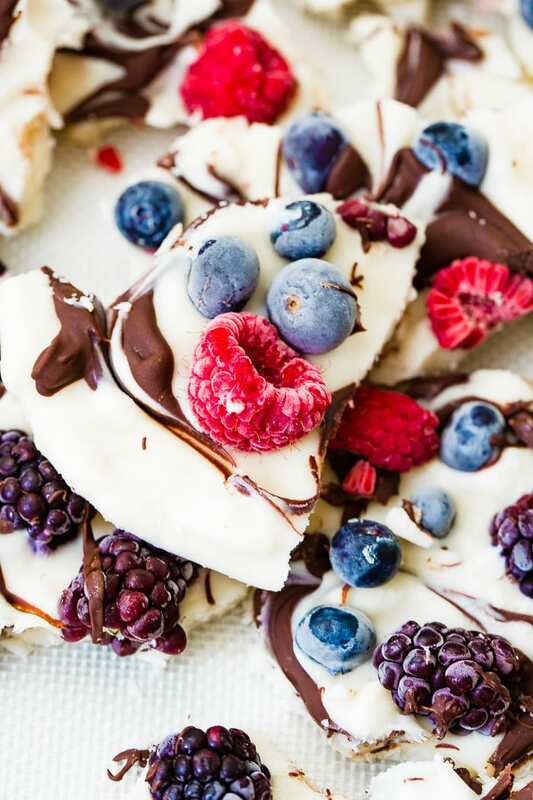 This Healthy Chocolate Swirl Berry Yogurt Bark is my new favorite thing and our kids’ too! 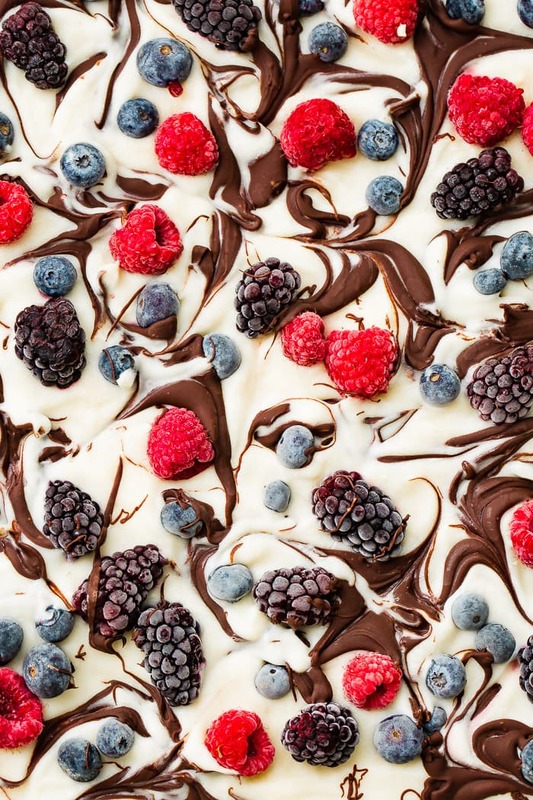 So what is Healthy Chocolate Swirl Berry Yogurt Bark? It’s exactly the name. 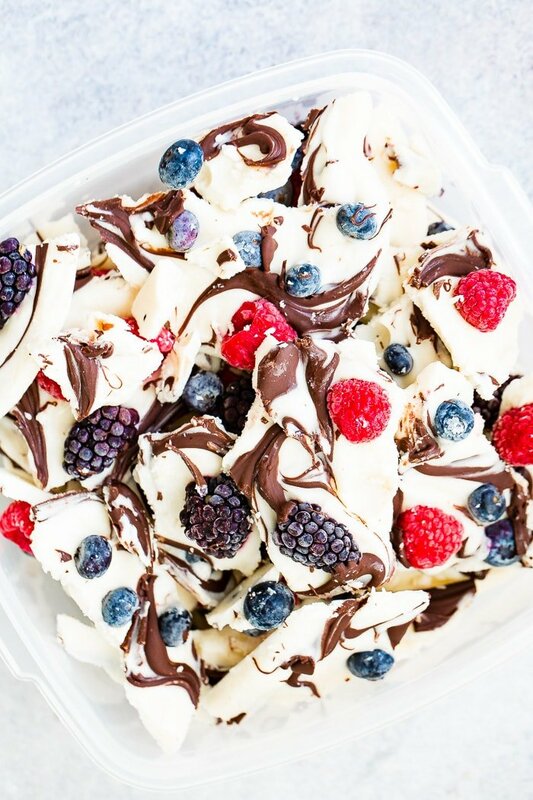 Greek yogurt that’s been covered in berries and swirled with chocolate then frozen and broken into bark pieces for a quick and easy healthy snack. It’s a great healthy after school snack or a healthy high protein and antioxidant snack for adults! You can skip the chocolate if you don’t like things that taste good. I mean, if you are trying to not eat so much sugar, but we really like those little swirls. Cade and I are big believers in snacking. Having a healthy snack in between meals is actually a great way to stop on top of healthy eating. You don’t overeat when you stay on top of your protein throughout the day. Snacking is absolutely good for you when you do it in the right way. Greek yogurt is a really good idea as it has protein and helps to fill you up. What are the Health Benefits of Berries? There are some great health benefits of berries! Berries are loaded with antioxidants. Antioxidants, such as vitamins C and E, and carotenoids, may help protect cells from damage. Berries may help improve blood sugar. They are high in fiber and everyone wants a healthy system. It’s known that they may help lower cholesterol levels which is important as we age as well! What Is The Difference Between Greek Yogurt and Regular Yogurt? Greek yogurt is strained 3 times, which removes most of the liquid. It makes for a thicker and richer in flavor and contains more protein than regular yogurt. Greek yogurt often tends to have less sugar than a regular yogurt as well. Just watch the fat and calories as not all yogurts are created equal. Yogurt is made from “sour” milk, but cultures of “friendly” bacteria are added as the milk sours to control the way it sours. These cultures create yogurt, a healthy dairy product. You can make your own yogurt at home using our, Instant Pot Homemade Yogurt. Yogurt can be frozen for up to 3 months, but we don’t often choose to do that unless it’s in bark form like this. When yogurt is frozen then thawed, it can separate and become grainy and watery. However, thawed yogurt is still healthy to eat so you aren’t losing any nutritional value. Looking for more healthy snack recipes? Healthy Herb Veggie Dip, Cheesy BBQ Chicken Zucchini Nachos, Peanut Butter Greek Yogurt Dip, Homemade Chocolate Chip Cookie Dough Protein Bars or Chocolate Blueberry Quinoa Bark! 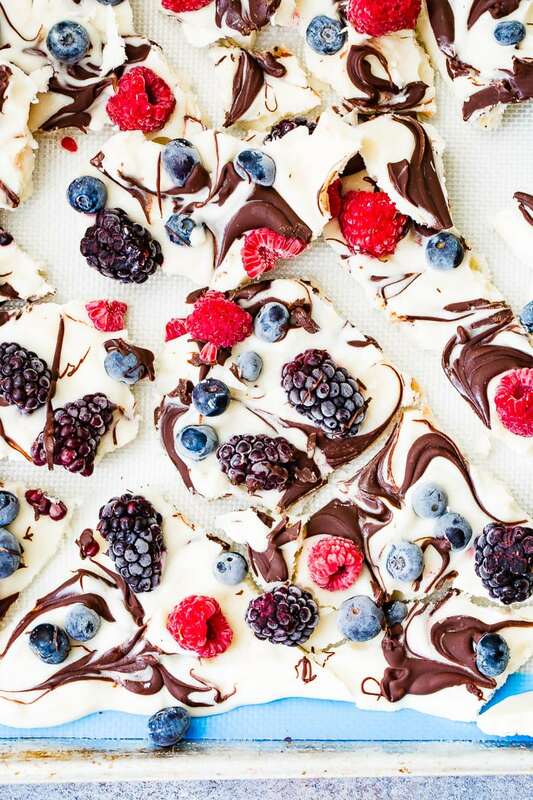 Our kids have been going crazy for this Healthy Chocolate Swirl Berry Yogurt Bark. 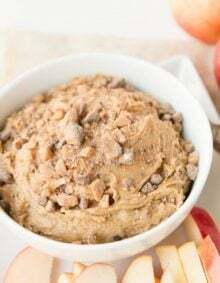 It takes 5 minutes to make and it's a great after school snack! 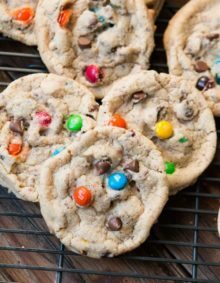 3/4 Cup Chocolate Chips (we did semi-sweet, but milk, or dark chocolate would both be good. Place the chocolate chips in a microwave safe bowl and heat for 30 second intervals, stirring in between until smooth. Allow to cool slightly. Place a Silpat (parchment paper does not work as well) on a rimmed cookie sheet and evenly spread the entire package of yogurt. Dot the chocolate in little mounds all over the bark. Use toothpicks to swirl the chocolate. Freeze for 4 hours or up to overnight or until hardened. Quickly break the bark and store in an airtight container for up to 2 weeks. This is so delicious! I keep a plastic bag of this in the freezer for my ice cream fix and even a quick little breakfast. I know the chocolate makes it less healthy but it’s so good. Thanks for the great idea. We are obsessed with this right now! It does curb that craving for sweets and a healthy way! 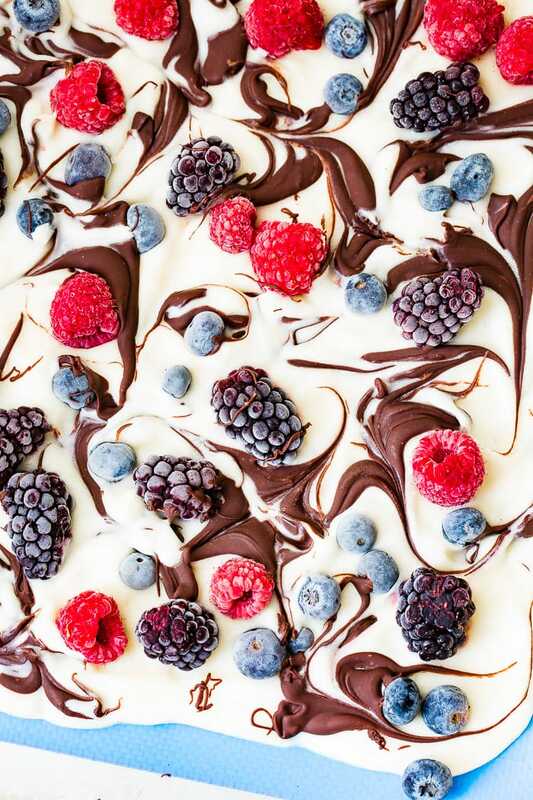 Chocolate makes everything better!